The astonishing return of Big Hero Six! Who, you ask? Why none other than Japan's top heroes, defending the land of the rising sun in the name of the Emperor! 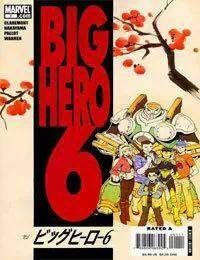 Come join Hiro (the smartest boy in Japan), Baymax (his trusty robot companion), Honey Lemon (with her all-containing handbag), Gogo Tomago (somersaulting into an unstoppable energy ball)… plus, who are the Six's two new members? When unknown super-villains strike Tokyo, BH6 is on the scene, and the stage is set for new adventure and a new series.<br />This issue includes 22 pages of story, 8 pages of sketches for the covers and main characters, and 8 pages of information and pictures of Big Hero 6, Baymax, Go-Go Tomago, Hiro, Honey Lemon, Silver Samurai, and Sunfire in the style of the Official Handbook of the Marvel Universe.